McLaren's Jenson Button believes the championship has effectively distilled down to a battle between Fernando Alonso and Sebastian Vettel. 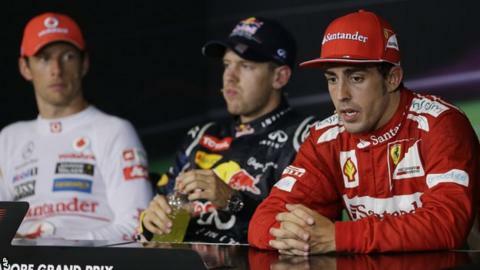 Red Bull's Vettel won the Singapore Grand Prix to close to within 29 points of leader Alonso, while Button, who was second, is 75 behind and Hamilton 52. "It's hard for anyone [to catch Alonso] except Seb at the moment," Button said. "It's between those two but there's still a lot of people with a long shot. That's what we're all going to go for." There are a maximum of 150 points available in the six remaining races. Hamilton was on course for victory in Singapore before retiring with gearbox failure, handing victory to Vettel, who headed Button's McLaren and Alonso's Ferrari across the line. It was Alonso's seventh podium position in the last 10 races, in which he has retired only once when he was hit by the flying Lotus of Romain Grosjean at the start in Belgium. Hamilton has retired from three of the last five grands prix, while Vettel and Button failed to finish in Italy two weeks ago. "It just shows one bad race makes a massive difference," Button said. "Fernando had his in Spa, Lewis had his in Spa and here, Seb had his at the last race. "I had mine in the last race. When no-one has the consistency you can't close a big gap on someone. Seb is only 29 points behind, that's a gap that's shrinking." Hamilton has insisted he has not given up on his title hopes, saying he will try to win all the remaining six races. McLaren boss Martin Whitmarsh hinted after the race that Button might start to sacrifice his own dim title hopes to help Hamilton. "Jenson has had a conversation with me, he initiated it," Whitmarsh said. "He's an immensely competitive individual, but he's a team player. Things that happen in the future will come from within him. I'll never ask and I don't want to ask. "If he chooses to do something in the best interest of the team, that's up to him." Red Bull team boss Christian Horner said he believed all the drivers in the top six in the championship were still in contention. Lotus's Kimi Raikkonen, who has not won a race so far this season, is third, 45 points behind Alonso, while Red Bull's Mark Webber is fifth, 61 points adrift, and 14 ahead of Button. Horner said: "The championship is wide open. It's just annoying Fernando keeps popping up on the podium at the end of the grand prix. "You have to include Mark, you have to include Jenson, even Kimi isn't far off and of course Lewis. There's six races still to go - 150 points still available, still a lot to play for." "Sebastian was 25 points down with two races to go in 2010, which indicates anything is possible for all the drivers. "We need to keep taking points off Fernando, which ideally means getting a few more cars between us and him."